Though there are a few different forms of gum (periodontal) disease, it is essentially an inflammation of the gums that is the result of an excess of plaque and tartar on the teeth. 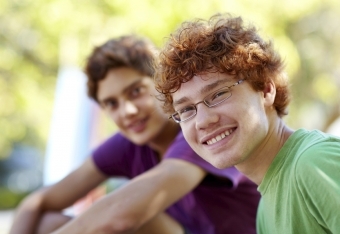 Gingivitis, the mildest form of gum disease, is the most common in teens. Gingivitis causes the gums to turn red, bleed easily, and become swollen and inflamed. If gingivitis is left untreated, it can progress into full blown gum disease (or periodontitis). In periodontitis, the gums recede away from the teeth and eventually form pockets. These pockets become infected, and over time, because the body tries to fight the infection by breaking down the connective tissue surrounding the it, teeth can begin to loosen and even fall out. Why are teenagers at a higher risk of gum disease? Teens are at a greater risk of gum disease because of the hormonal changes that take place during puberty. Essentially, increased hormone levels cause increased blood circulation throughout the body, including the gums. This can increase teenagers' gums' sensitivity to irritation, plaque, or food particles, which results in their turning red and feeling tender. A consistent and thorough at-home oral hygiene routine is the best way to avoid gum disease. This includes brushing and flossing twice daily, and regular cleanings at the dentist's offce. If your teen’s oral health routine could use some improvement, work with him or her to get it back on track. Make an appointment with a dentist Smile Town Burnaby. Aside from our professional cleaning services, our dentists and hygienists can provide advice, tips, information and demonstrations that will help your teen better care for his or her teeth and gums. Then, make sure your teen maintains his or her oral care routine at home. Remind your teen to brush and floss regularly, and make a variety of toothbrushes, toothpaste, flosses, mouthwash, and dental picks readily available (Teenagers may put on a tough act, but they're still capable of appreciating the novelty of uniquely flavoured and coloured flosses and toothpastes!). Make these dental health care products readily available at all the sinks in your house, so that taking care of his or her teeth is as convenient as possible for your teen. Although emphasizing good oral health to your teen is important, it won't do much good if you don’t practice what you preach! Show your teen that you mean what you say, and give your own oral care routine an overhaul. Chances are, this will do you good, too.